Rasam or Charu is an essential part of a traditional Andhra bhojanam (meal). Comforting, earthy, warm with health supporting properties, pepper flavored charu is seasoned with asafoetida and garnished with fresh coriander. Works as a perfect antidote for a runny nose. 1 Heat a deep vessel, add 3 cups of water, chopped tomatoes, tamarind extract, salt, turmeric pwd, few fresh curry leaves and pinch of jaggery and bring to a boil. Continue to boil for 3 mts. 2 Add the ground charu podi and mashed dal and cook for another 5 mts. 3 Heat oil in a pan, add mustard seeds and as they splutter, add red chili and curry leaves and stir fry for a few seconds. Add asafeotida and turn off heat. 4 Add this to the charu and combine. Turn off heat and place lid. Garnish with coriander leaves and serve with white rice and appadams. hi sailu garu… miryala charu is most awaited recipe for me. My husband loves this with a combination of mudda pappu. Also works gud for this season. thanks a lot. One of my favorite’s is rasam. I am up for it anytime of the day and year. Looks awesome! Rasam looks awesome. I will def try it. I was waiting for this recipe. will try this now …. I will get back again about the rasam i prepared ……..
Great for cold and cough, Amma always made pepper rasam when one of us fall sick. my fav rasam.. looks absolutely perfect and delicious..
hey Sailu: Rasam looks awesome ! one could just drink it like a concoction for a bad cold / runny nose.. ! we make a similar version without the tomatoes though ! Simple recipe.. slurpy anyday ! yenni rojulnunchi wait chesthunnano ee recipe kosam…thank you so much. Wat a warm and comforting soup..
Mouthwatering charu ..I love it. Very delicious. I love black pepper anyway. Great dish for this blustery weather. thank you. U have very nice posts. Can u please show me some cakes that can be done in un grilled microwave oven or rice cooker or normal pressure cooker? Thanks for the miriyala chaaru recipe. I’m pregnant and have been craving my mother’s miriyala chaaru recipe (she lives too far away) and this post seems like a godsend. Thanks. Will be trying this tonight. I tried your miryala charu today because of the cold season. This was the first time this charu was really tasty when i made it. I always scared to do it but i followed your procedure. It tasted really good. Everyone liked it. Its really comforting too. I added 1 small roasted garlic in the powder and 1 garlic in the water just to give extra flavor. It tasted yummy. Nice post…Awesome chaaru..and where did you find that nice chaaru ginni in the backdrop? !Looks very good.nice chole recipe..will try it soon. I made it in my home and everyone loved it(we are from north india).Thanks a lot. I am the one, who does not find time to cook. When suffering from cold and cough, I decided to make it and wow what a recipe- blown away, got all my sinuses cleared. Good recipe which I had asked 2-3 people but never got the proportion or combination right. Thanks to you sailu. Good job. My husband is too choosy in food. 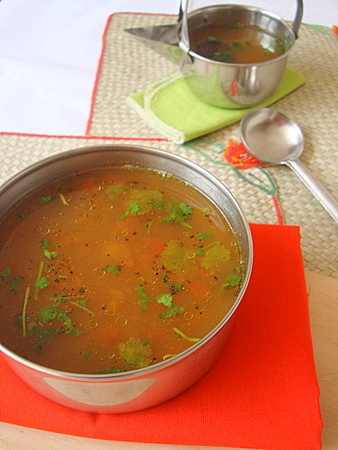 I was fed up of making Rasam.I tried many times but my husband never liked it. When I tried this recipe today for lunch,he happily ate it with rice. Its fast to cook .I also added some chopped Mint leaves to it.It really tasted well with an awesome fragrance. This is by far the best Charu recipe I’ve come across! 🙂 Simply amazing podi. I use the same podi to top off curries and my family just keeps asking for more! But, that is not miryala charu! That is tomato rasam. If you go back to pre 1950s, there were no tomatoes (or not very popular) used in Andhra. Miryala charu should go with 1 tsp of pepper powder, 1tsp of jeera, 1tsp of dhania powder ground with green chillies and or either with garlic or a pinch of hing. This should be added just before you close the boiling charu.